PC gamers are understandably wary of Dark Souls II. The first Dark Souls arrived on PC in less than ideal shape, with a limited frame-rate and resolution and lousy controls. The big question has been: How will the PC version of Dark Souls II stack up? The first game was rescued by heroic modders, and these days it can look downright amazing. Late last year, the sequel's producer promised that the sequel wouldn't require so many fan-made fixes; they had learned from the first game, and this time they'd take their time with the PC version and get it right. I'm about 13 hours into what PR representatives call a preview build of the PC version of the game. 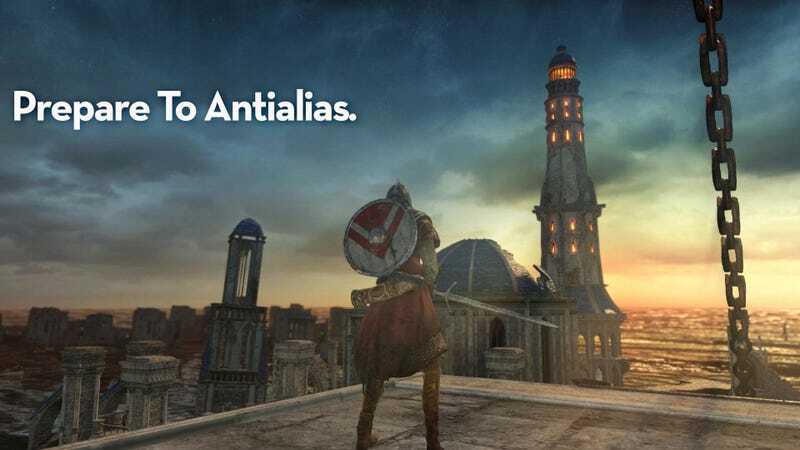 It runs in Steam as "Dark Souls II early access," and by all appearances looks like the full game, though I'm guessing it will get a few small updates as the April 25 release date draws nearer. My general impressions: The game runs at 1920x1080 resolution and 60 frames per second for me with my settings maxed out, and it looks nice enough. Certainly an improvement over how the first game ran at launch on PC, and obviously sharper than either console version. And of course, unlike its predecessor, it runs completely free of Games for Windows Live. At times, Dark Souls II looks beautiful on PC, though a lot of the time it looks, well, like an up-res'd last-gen console port. The environment textures in the world seem flat and the lighting looks more or less the same as how it was on the consoles—it's still a far cry from those amazing lighting effects we saw back when the game was still in development. I've noticed in some places—say, standing in front of a bonfire in a cave—my character won't even cast a shadow. It's not a massive deal, but considering how atmospheric Dark Souls II can be, it's a shame that the lighting doesn't look more atmospheric. I'm afraid I haven't put much time into the PS3 version and can't really speak authoritatively to the differences between the two, but my short and moderately unscientific opinion is: The game looks fine on PC, and it runs really well, or at least it has on my mid-tier gaming rig. And of course, most importantly: It's Dark Souls II, which means it's a really good game. One thing I can speak authoritatively to is the amount of customization possible. Rather, I can just show you. (I really like that I can set the HUD to hide when it's not needed. Great for screenshots! Dark Souls II appears to be as promised in terms of PC-specific customization, offering a bunch of the usual graphical options and remappable mouse/keyboard controls. I play mostly with a controller on my TV, but the mouse and keyboard controls feel good to me, and I like how customizable they are. One bummer is that the menu button prompts are always keyed to an Xbox 360 controller, even if you're using mouse and keyboard. It's annoying, though possible to work around once you're familiar with the controls. You also can't keep moving around after calling up the inventory/character menus like you can with a controller, though that's less of a big deal. For a more in-depth comparison of the PC and console versions, I'd suggest checking out Kevin VanOrd's breakdown at Gamespot, which features an informed analysis of the differences, along with a nice slider image gallery. He even went and compared Dark Souls II PC to a modded version of Dark Souls, also on PC. I'm looking forward to seeing what modders do once they get their hands on Dark Souls II at the end of the month. Happily, they'll be starting off with a much stronger base than they did the last time around.